The simple answer is because we felt it HAD to happen. Buying a wedding dress can feel really scary and we wanted to take some of this angst away and simplify the whole process. No pushy sales techniques required. Just a little sanctuary of honest advice from a pair of complete nutters! What more could a bride to be need! 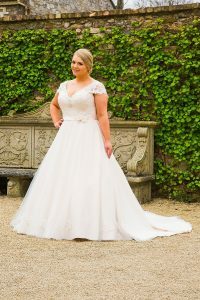 We originally opened the shop to sell ex sample wedding dresses but it soon became apparent that we were getting curvy ladies who just wanted to feel ‘safe’ in a place where they didn’t feel embarrassed or ashamed about their body. Just for the record I don’t believe anyone should feel like that or feel they should diet for their wedding but that’s another blog in itself! We did and still do pride ourselves on not looking, feeling or running like a bridal shop, except for the fact its full of wedding dresses – no getting away from that! Finally, they arrived and WOW! The dresses did not disappoint. The quality we had chosen made us giddy with excitement. Not only were the gowns gorgeous but they were well structured as well…hoorah! Naturaly we immediately tried them on and couldn’t stop twirling- mental note, must learn to lock the door in future when playing dress up! Now if only there was a way to tell everyone. “Come on in, we’re safe and lovely and have your best interests at heart”. I often throw in a wild card dress during an appointment just to be sure you’ve looked at EVERYTHING and so does mum, usually we’re not on the same page as each other but I must admit she’s pretty blumin good at it. She picked mine after all – there mum I’ve told the world but I’m sure you’ll get the full tale off her should you come in! 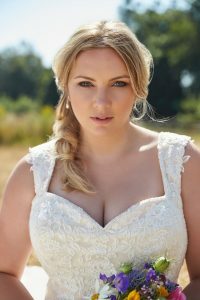 So back to the question… what made us specialise in curvy bridal wear? Lots of lovely ladies saying we should start doing it helped. Ha! Finding out that most shops stocked samples up to a 14 had a big impact especially given that the national average in the UK is a size 16! Erm, hello? 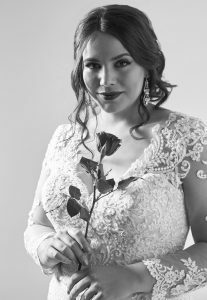 If being curvy is such a crime then why do so many plus size wedding dress specialist exist with even more appearing every year! Personally, I love how a pair of hips or an ample bust fill a wedding dress, defining the shape women spend most of the year covering up or hiding away-myself included. We genuinely love what we do, through the highs and lows, happiness and tears we couldn’t wish to meet a happier bunch of ladies. This is a momentous life decision and most women arrive petrified and leave wanting to stay a little bit longer…mum does make a mean cup of tea after all, think it’s because she’s from Yorkshire!